Here at last, the definitive history of the Australian Quarter Horse. 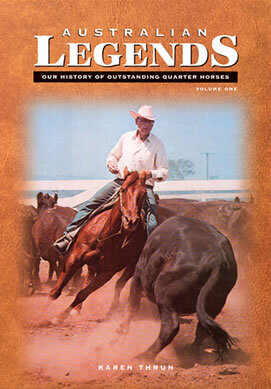 There are many excellent and informative books available today on the history of the American Quarter Horse and the famous King Ranch in Texas. This book however, covers the development of the Australian Quarter Horse history, which began a relatively short time ago with the 1954 arrival of the first four King Ranch stallions – Vaquero, Jackaroo, Gold Standard and Mescal. 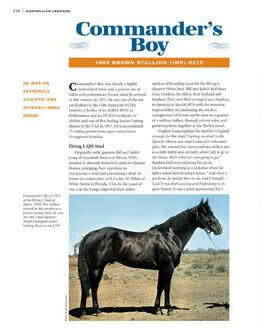 It also showcases some of our most outstanding early stallions and mares that gained popularity in the founding years of the breed and had a profound effect on the development of the Quarter Horse in Australia. Each chapter profiles the story of their lives and the people associated with them and features some of their best progeny. Included in this ground-breaking 336-page full colour book are historical photographs supporting the chapters and a four generation pedigree for each of the featured horses. This attractive soft-cover publication has a noticeable quality and is of a substantial weight in the hand.It contains a significant amount of highly-informative historical data and a little light-hearted content. 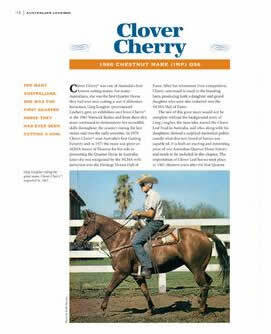 These horses have been selected, in most cases, for their contribution and impact on the breed in Australia, and many of them are NCHA and AQHA Hall of Fame inductees. Through their stories and the introductory chapters, Karen has creatively outlined the history of the founding years of the Australian Quarter Horse. My selection of horses was not an easy task. It appears that a horse has to be long dead before it can ever be fully appreciated. I accept there will be some who disagree with my choices, having their own personal preferences, and that is only natural. It was also impossible to include all of the progeny from these horses and all of the people who have made a valuable contribution to the breed, so I do apologise for those I have neglected to mention. My research has come from a wide variety of printed material produced in those early years, often with its own contradictions. I have endeavoured to be as accurate as possible, but I realise readers may find errors. Several of our early pioneers have already passed away and with them, their personal stories. And often when asking people to recall memories or details from many years ago, their recollections can become vague or even a little exagerrated at times, especially if they’ve been handed down. Originally I planned to include more horses in this first book, but as I progressed it developed to such a scale that I was eventually limited to the number of horses listed above. However, for those who may be disappointed that their favourite is not amongst them, rest assured because Australian Legends – Volume 2 is already in the making. I truly admire these magnificent animals and have the utmost respect for the dedicated pioneers who introduced them to our great country. It has been an incredible journey for me over these past four years and I do hope you enjoy reading this book as much as I have enjoyed putting it together.